Medford Roofing understands that all roofs are susceptible to deficiencies that can lead to future leaks. Water infiltration can compromise the internal structure of the building, damage inventory and equipment, and put people at risk of injury from slipping on the wet surface. Commercial property repairs need to be done quickly and right the first time in order to avoid disrupting daily operations. 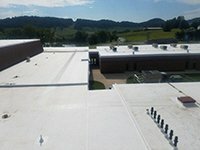 With Medford Roofing’s extensive experience in leak location and repairs, we are able to fix your problem immediately and ensure that there will be little to no down time in your business operations.